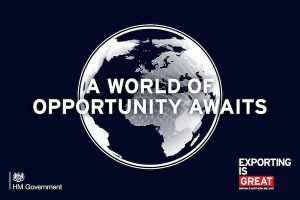 In December, the DBA’s Chief Executive Deborah Dawton, and Head of Services Adam Fennelow attended a reception at the Foreign and Commonwealth Office where Graham Stewart MP, Minister for Investment at the Department for International Trade (DIT) championed export opportunities for UK business. DIT’s role in promoting inward investment and supporting UK businesses to have a footprint across the world has become ever more crucial as a solution to the undeniable uncertainty affecting UK business after Brexit. As the Minister stated in his opening address “playing in more markets makes your business more secure”. 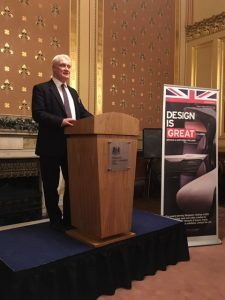 Attendees British Airways, Turkish Airlines, China Southern and more heard about the “great British success story” that is the UK’s might in the airline interior industries, with the Minister revealing the sheer reach of the work being done by UK businesses. The reception brought together MPs, policy makers, airline industry representatives and industrial and product design industry guests to stimulate collaboration and future export opportunities for UK businesses. Guests were encouraged to explore support and exchange information in export financing, certification, R&D and supply chain management and to meet design agencies that deliver world-leading work for their clients. He highlighted the new business opportunities that collaboration with DIT has generated for Tangerine. From being featured as Export Advocates in the department’s global “GREAT” campaign to joining DIT’s first trade mission to the Aircraft Interiors Expo in Hamburg, Tangerine has been able to explore new markets, make new connections and generate long-term and profitable client business. The DBA’s latest Annual Survey Report highlighted that on average for member agencies, 24% of fee income is from overseas clients. 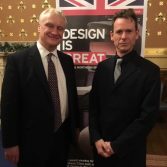 Many DBA members are successfully selling their design services abroad and with the current political and economic turbulence in the UK, the opportunity to increase this activity should be exploited. The UK is seen as the home of the best creative talent in the world. We have also traditionally been seen as expensive, but exchange rates are in our favour – suddenly the world can afford British design. The DBA is working closely with DIT to identify opportunities for growth amongst the membership. Through our work over the coming years, we will be supporting you to expand your reach internationally into new markets and for those of you who are yet to embark on overseas trade, helping you prepare your business to successfully export.